Orange has been called the happiest of colors and is a stunning match to this in-town gem! This 1915's classic flaunts original hardwoods, period moldings, exposed brick and one sweet, eclectic feel. Comfortable living begins in front of the pellet stove, a compliment to the newer gas furnace and foam insulated basement, attic and garage. Living & dining combine to open from the covered front porch and onto a flagstone patio & fully fenced side yard. Light filled galley style kitchen showcases concrete tops, gas range, stainless appliances, added nooks & storage. Special updates to this home include full basement encapsulation, water cop, sump pump, bathroom floor tiles, vanities and plumbing line replacement. Private corner location w/ level fenced-in yard, beautiful trees & plantings for an easy, low maintenance space. Concrete driveway and a 1-car garage for additional off-street parking & storage. 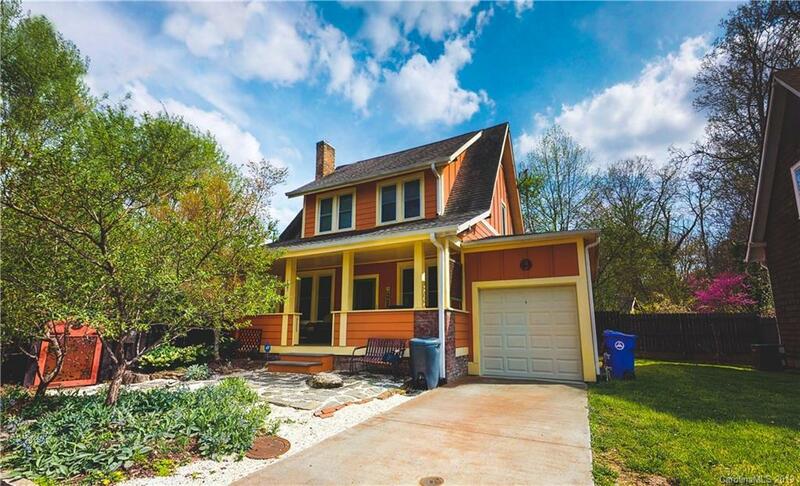 Amazing walkable location - steps from shopping, restaurants & DT Asheville!